Town of Michigan /Lansing. —. Town of Michigan. ) In 1847, required by Michigan's 1835 constitution to choose a permanent capital site within the first decade of statehood, the legislature voted to move the capital from Detroit. Convinced that the governmental seat should be in the state's interior, legislators voted to relocate in Ingham County's unsettled Lansing Township. Citizens viewed the choice with skepticism-believing the decision was a joke that backfired. 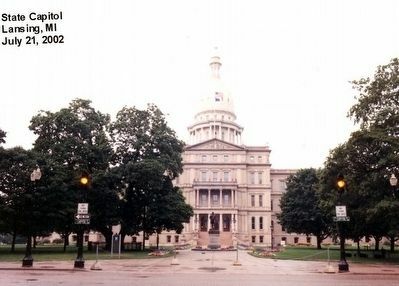 The capital commission platted the "Town of Michigan" in 1847 and chose a site bounded by Washington and Capitol avenues and Allegan and Washtenaw streets for a temporary capitol building. When the legislature met that year, many members were forced to lodge in private homes; others made their beds on the capitol floor. During that session, the legislature renamed the capital city Lansing.
) In 1847, required by Michigan's 1835 constitution to choose a permanent capital site within the first decade of statehood, the legislature voted to move the capital from Detroit. Convinced that the governmental seat should be in the state's interior, legislators voted to relocate in Ingham County's unsettled Lansing Township. Citizens viewed the choice with skepticism-believing the decision was a joke that backfired. 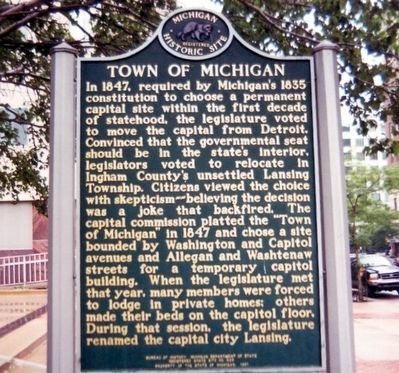 The capital commission platted the "Town of Michigan" in 1847 and chose a site bounded by Washington and Capitol avenues and Allegan and Washtenaw streets for a temporary capitol building. When the legislature met that year, many members were forced to lodge in private homes; others made their beds on the capitol floor. During that session, the legislature renamed the capital city Lansing. a wilderness fraught with wolves and a "brain fever" (spinal meningitis) epidemic. In 1859, Lansing was incorporated as a city. During the 1870s, Lansing's lyceums and literary societies hosted author Mark Twain and actor Edwin Booth. The 1847 capitol, considered "an old rattle trap," was replaced by the present building in 1879. 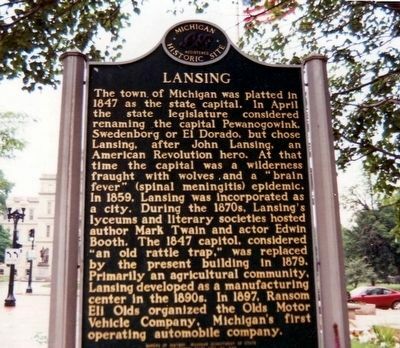 Primarily an agricultural community, Lansing developed as a manufacturing center in the 1890s. In 1897, Ransom Eli Olds organized the Olds Motor Vehicle Company, Michigan's first operating automobile company. Location. 42° 43.972′ N, 84° 33.274′ W. Marker is in Lansing, Michigan, in Ingham County. Marker is on North Capitol Avenue. Touch for map. The marker is on the grounds of the Michigan State Capitol. Marker is in this post office area: Lansing MI 48933, United States of America. Touch for directions. (about 300 feet away, measured in a direct line); Austin Blair (about 300 feet away); Michigan State Capitol / Michigan's Three Capitols (about 300 feet away); Michigan (about 400 feet away); First Regiment Michigan Engineers (about 400 feet away). Touch for a list and map of all markers in Lansing. More. Search the internet for Town of Michigan /Lansing. Credits. This page was last revised on June 16, 2016. This page originally submitted on March 4, 2016, by Don Morfe of Baltimore, Maryland. This page has been viewed 218 times since then and 3 times this year. Photos: 1, 2, 3. submitted on March 4, 2016, by Don Morfe of Baltimore, Maryland. • Bill Pfingsten was the editor who published this page.